3) and reading his favorite vampire book (Fang Goodness) over and over. His self-involved older sister and workaholic Mom think he needs to stop obsessing already! But when his Dad finally allows Jimmy to get a puppy before school starts, everything changes and Jimmy has something new to focus on: his amazing dog, Abby who seems to have some very unusual habits. She sleeps all day but is wired at night, and she runs from the garlic kelp biscuit made by Jimmy's strange new babysitter Mrs. Cragg. There's just something different about Abby. Could she possibly be...a vampire? Jimmy's best friend Irwin thinks Jimmy's being ridiculous, but then when Abby uncovers a real crime in progress and helps him become friends with an actual, human girl, even Irwin has to admit that perhaps Abby might have some super powers after all. 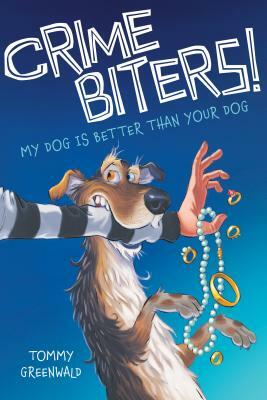 Adam Stower has illustrated many books for children including the Crimebiters series by Tommy Greenwald. He studied illustration at the Norwich School of Art and Design and at the University of Brighton. He lives with his daughter in Brighton, England. You can visit him at www.worldofadam.com.